To make your move easier. The Mortgage Advice Bureau offer bespoke mortgage advice and search thousands of mortgages to help find the right deal for you. As a new agent in North Leeds, using great photography is key to us, as is capturing the best images possible, using high quality equipment (a professional photographer) and carefully considering what homebuyers want to see. Never scrimp on the cost of a Professional photographer, some agents feel it is part of their role to take the photographs, and true, Smart phones are now advanced, but it is not just about a shoot and grab picture - An Agents time is much better spent communicating with clients. We always use horizontal landscape views, which are more pleasing on the eye than vertical – although a different set of photographs may need taking for use on social media. A cluttered, messy photo can reflect lazy work from an agent – everything should be removed from kitchen and bathroom surfaces, especially around the sinks. Old towels are a definite no in bathrooms as are clothes hanging over radiators, and kitchens should be curated with a nice set of dishes, bowls of fruit or flowers. In some properties it is difficult to photograph an entire room at once, we often move furniture around so that we can capture the perfect angle, photograph through doorways and always keep internal doors open – the TV should never be left on! Working around the weather is key, but we have some clever sky replacement techniques if the elements are against us and our photographer will always ensure that cars and dustbins aren’t in the shot. Shooting external photos at dusk can give dramatic results – we use dawn to dusk techniques whenever possible which enhance the pictures. A professional photographer will shadow and colour boost – space and natural light are two qualities home buyers are always looking for. Only the best photos should be used, buyers don’t want to sift through an entire library of images, d at least 5 pictures should be used to give searchers a flavour for every room, remembering that it is the first two weeks when a new property will get the most viewings. 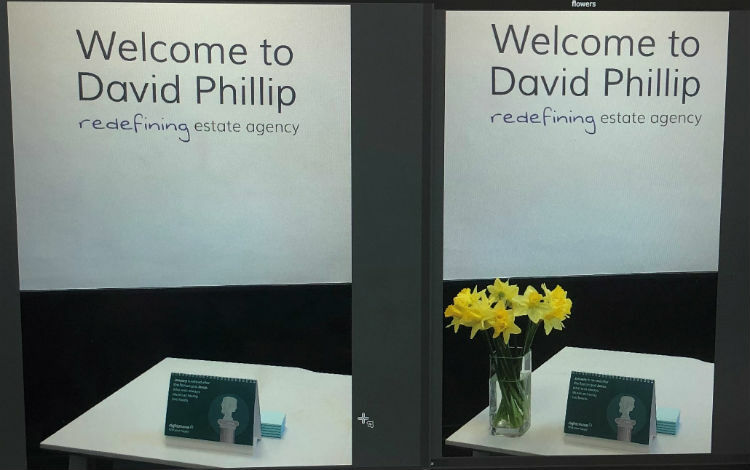 Detailed views on Rightmove shows how well your agent is marketing your property, at David Phillip Estate agents we averaged 146 viewing per day from October 1st which hi-lihgts the priority we take on getting the best photographs possible for clients. This form is protected by reCAPTCHA, Google Privacy and Terms apply.